Ok I will have to think of something funny and post tomorrow. But I just had to say that I'm up way too late and that was way too funny. Ova Achiever. I don't think I post good comments but I'll try. Okay maybe not. Yay for 6 months! Oh my gosh - that ovary is too funny! Ha! I love it! I would love a good, cyst free ovary. I can't think of anything funny at the moment, so I'll go with interesting. DH and I have traveled to 43 states together in the last 9 years. We have this list of 10 things we try to do in each state, like go for a hike, see a concert, eat at an independent restaurant, etc. It's like a giant scavenger hunt. We keep track of it in a giant spreadsheet. Yes, we are dorks! i carried around a rubber chicken named "Herbie". I collect holiday themed eeyores and then forget to display them. I buy mostly organic but have a sick addiction to cheap frozen pizza. I HATE EGGNOG. DOWN WITH NOG! Sometimes I fart in my sisters car, lock the windows and put the air on recirculate and laugh at her. 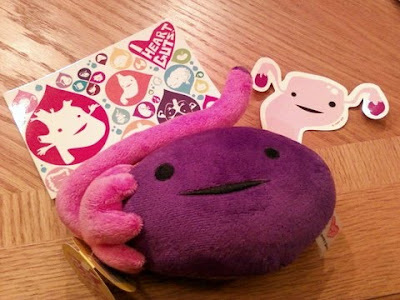 That ovary is too cute! I love the name....Ova Achiever! Too Darn Cute! Well I go completely nuts decorating for Halloween every year. Last year we were the envy of the neighborhood as I redid my entire front living room Tim Burton style. This year my dream is to recreate Bagdad Cemetery in our front yard. Bagdad Cemetery is a local cemetery where the opening scenes to the original Texas Chainsaw Massacre was filmed. I love that cemetery! Last year after decorating for Christmas I got really sick with my PCOS and was in and out of the hospital with heavy bleeding .....I couldn't take the decorations down until March. It really sucked. Hopefully I won't get sick this holiday season. Hilarious!! I will only take it if it is a right ovary because had my right ovary removed due to cysts!!! My Lefty would love to have a partner in crime once again!!!!! Definitely not fuzzy and cute like the ovary and basically creepy. Something about myself that is kinda funny is I am addicted to talk radio. Ya it completely disgusts my husband but I am a sucker for Cosmo radio and Broadminded, God love whoever created XM!! I am a new reader. I am on approximately 278 of my cycle. That's almost 9 months. I am starting a clomid cycle in less than a month. I am a PhD student. I spend more time reading blogs than I do studying. I don't yet know how big of a problem this is. I read around 30 blogs every day. When I find a new one I spend hours reading from the beginning. I'm happy I found your blog to feed my habit. Oh my this is adorable!! I would love to win, its been 2 years TTC and nothin yet maybe the third ovary only one lacking cycts will help lol.